Find everything you need to entertain in the great outdoors. Home Décor & Decorating Ideas: A curated selection of products to decorate your home, including pillows covers & throws, frames & wall décor, beautiful books, candles & home fragrance, home accents & objets, lighting & lamps, storage solutions and so much more. 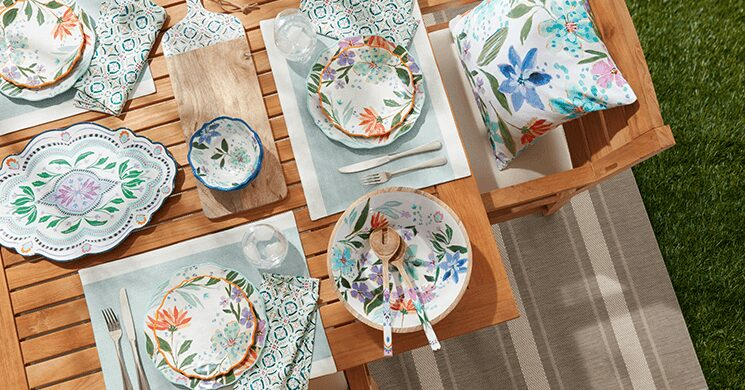 Tabletop & Entertaining: Set the table for a feast with family or friends with our full assortment of serveware, dinnerware & glassware by Indigo and other top brands including Kate Spade New York, Le Creuset, and Sophie Conran. Feel like a top chef in your kitchen with our catalogue of cookware & small appliances including stand mixers, pasta makers, blenders, juicers, egg cookers and toasters from top brands like Smeg and Dash. Tea & Coffee: Spend a cozy evening at home with a great book and a warm cup of tea in our easy-to-brew tea mugs, tea sets, and tea pots. We also offer matcha shakers, French press, pour-over coffee makers, and kettles. Add a milk frother for a deluxe make-it-yourself barista experience. Water Bottles & Lunch Containers: Shop our selection of food storage and containers to help preserve your food longer and save money on groceries. Choose from difference shapes and materials with options that are glass, BPA-free, microwave & dishwasher-safe. Shop our assortment of bento boxes, lunch bags and lunch containers to make packing a lunch for yourself or your family easy and mess-free! Don’t forget to pack your water bottle to help reach your daily hydration quota. Shop our selection of insulated, glass, and infuse, plastic, and tumbler water bottles by Indigo or top brands such as S’well, BKR, Asobu, and more. Free shipping on orders over $25.